Google has introduced a new version of the search engine's home page, which features a sleek fade-in effect that hides all the elements of the page except the logo, search bar, and the buttons. When accessing the main Google search page, you will only see the Google logo (or the doodle of the day) and the super-sized search bar (introduced a few months ago) with the search buttons underneath. The rest of the elements of the page, such as links to Gmail, Documents, News, Maps, Shopping, etc., will be revealed with a fancy fade-in effect when you fist move the cursor on the screen. Google's new search homepage is now even less crowded, in comparison to Bing, the competing search engine from Microsoft, which overlays different images under the search bar daily and features search queries of interest. The fading Google homepage was first noticed a few months ago, when Google was experimenting with different designs. 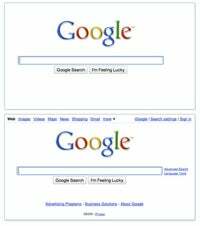 The search company says it tried about ten versions of the fading homepage and chose the current one based on "user happiness metrics". Some of the earlier versions of the fade-in Google homepage had an even more minimalistic approach, with the search buttons hidden at first. The final version of the fading homepage is now being introduced to Google home pages around the world. Google explains in a blog post that it was concerned with the time to first action on the new homepage, which could confuse users initially. "We want users to notice this change... and it does take time to notice something (though in this case, only milliseconds!). "Our goal then became to understand whether or not over time the users began to use the homepage even more efficiently than the control group and, sure enough, that was the trend we observed," the Google team explained. Google also introduced a better format for image search results earlier this week. The new image search layout will show a larger image and additional smaller images alongside. In a previous update in November, Google also introduced Image Swirl, which bring layers of similar images into searches.